You don’t see turnouts like this very often. 123% of Sevastopol, Crimea residents voted yesterday to join with Mother Russia. If you believe the Crimean “authorities”, 474,137 people voted in Sevastopol “referendum”. However, as of November 1, 2013, according to the statistics in Sevastopol , all the permanent population of the city – 383,499 people, and is present at the time – 385,462 people. At the end of last year, the voting population of Sebastopol was 385,462. This tailored to the children who did not have the right to vote. 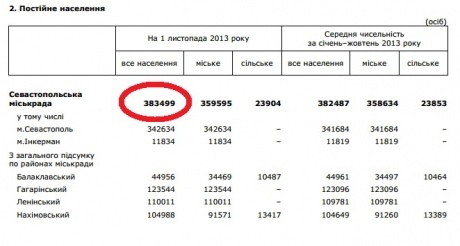 474,137 – 385,462 = 88,675 people accidentally appeared in Sevastopol to vote during the referendum. 474 137/385 462 * 100 = 123% of Sevastopol voted for entry into Russia.